Featuring an intelligent and exceedingly witty score from Tony-nominated Composer Paul Gordon, (who also provided the book,) his lyrics are blithe, bubbly, astute and amusing while remaining 100% true to Austen’s fundamental intent..in any case, few if any, previous versions capture the buoyant energy and unabashed fun as wonderfully as this new production now playing in Anaheim California! “Oh Hello! My name is Miss Emma Woodhouse—I enjoy the best blessings of existence and find there is very little to vex or distress me; My father and I live in the town of Highbury where our family is afforded no equals!” Mandy Foster stars as “Miss Emma Woodhouse” in the regional premiere of Jane Austen’s “Emma, The Musical” at “The Chance Theater” in Anaheim, CA. ‘I know it is not improper’ for us to discuss the latest offering in the “Chance Theater’s” annual “Holiday Literature Series”, which features musicals based on family-friendly works of classic literature; ‘I have been discreet but now I’m overdue’, as I point out that this award-winning theater company is presently acquainting So Cal audiences with Jane Austen’s “Emma: The Musical”! 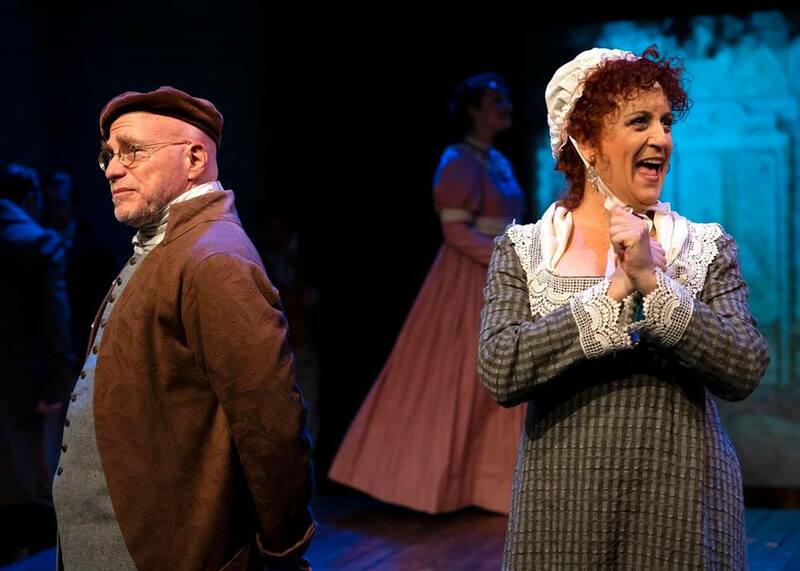 Based on one of literature’s most beguiling and enduring love stories (the very last of the groundbreaking novelist’s works published in her lifetime,) this vivacious musical has been brought to vibrant life on The Chance Theater’s “Cripe Stage”. With a book, lyrics, and music by Tony-nominated Composer Paul Gordon (renowned for his prior musical adaptation of another pioneering female author’s most famous tome, namely Charlotte Bronte’s “Jane Eyre”,) this Orange County debut is directed by Casey Long, with musical direction by Bill Strongin, A staple of popular and literary culture since its inaugural publication in 1816, “Emma” has served as the source for numerous adaptations on the big-screen, the small-screen, and the stage–including several miniseries, a 1996 blockbuster film starring Gwyneth Paltrow in the title role, and was even ‘updated’ and re-set in Beverly Hills for the 1995 comedy “Clueless” starring Alicia Silverstone; in any case, few if any, previous versions capture the buoyant energy and unabashed fun as wonderfully as this new production now playing in Anaheim California! “Mr. Knightley loves to find fault with me! His brother is married to my sister and we always say what we like to one another. Heavens knows he never flatters me…or I, him!” Mandy Foster as “Emma Woodhouse” verbally spars with Jeff Lowe as “Mr. Knightley” in Jane Austen’s “Emma, The Musical” at “The Chance Theater” in Anaheim, CA. Featuring an intelligent and exceedingly witty score from Tony-nominated Composer Paul Gordon, (who also provided the book,) although there are few if any real ‘stand-part’ numbers, he instead delightfully employs music and song as extensions of the dialogue or as an opportunity for characters to give vent to their otherwise ‘unspoken’ thoughts. In this latter regard specifically, his lyrics are blithe, bubbly, astute and amusing while remaining 100% true to Austen’s fundamental intent. A fine example of this occurs as part of “Have Another Piece Of Cake” which rates among the sharpest and most side-splitting comedic stanzas in this or any musical, in which our lass “Emma” at length comes face-to-face with her storied ‘rival’, “Miss Jane Fairfax”: “What a stupendous—Icy—stare!” she fumes unheard by those with whom she’s attending a ‘civilized’ ladies tea; “I cannot ‘improve her’ or form her opinions (—she seems to have none of her own!) I don’t like her intentions–she stirs my apprehension…and snobbery and arrogance only look good on me!” Textually speaking, here is a fast-paced but well-focused re-envisioning as opposed to other renderings of the story which too-often become bogged down in incidental episodes or side-plots. That said though, diehard Austen fans need not be worried that in adapting such a magnum opus for the musical stage too much has been sacrificed for the sake of expedience. Instead, Gordon’s libretto steadfastly concentrates on our Heroine, commendably packing a humongous amount of plot into a scant two (or so) hours, while preserving all the most distinguished and treasured loves scenes and incidents from the novel. One way he does this is by having his main character frequently address the audience directly while those she’s dealing with address her. Interestingly too, is how (in faithfully adhering to the overall times and fashions of that generation,) the script contains almost NO ‘contractions—a speech defect thought to be ‘vulgar’ for people of “Emma’s” station and society back in those days. “Happy Day! Miss Taylor, my former Governess and ‘Best Friend in the World’ has just become ‘Mrs. Weston’!” Lulu Mack is a blushing bride as the recently wedded “Mrs. Weston” with Robin Walton as her brand-new husband, “Mr. 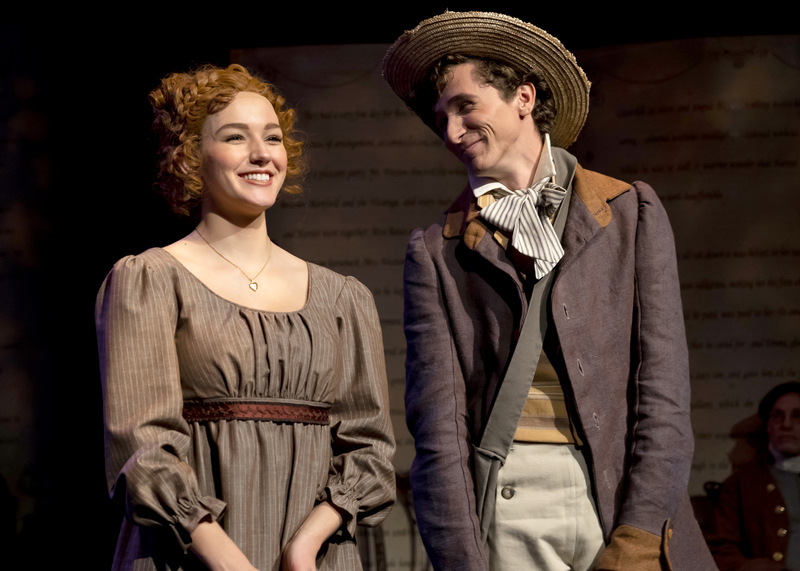 Weston” in Jane Austen’s ‘Emma, The Musical” at “The Chance Theater” in Anaheim, CA. “Isn’t he lovely? Isn’t he charming and kind and good-natured and polite? Isn’t he humble? 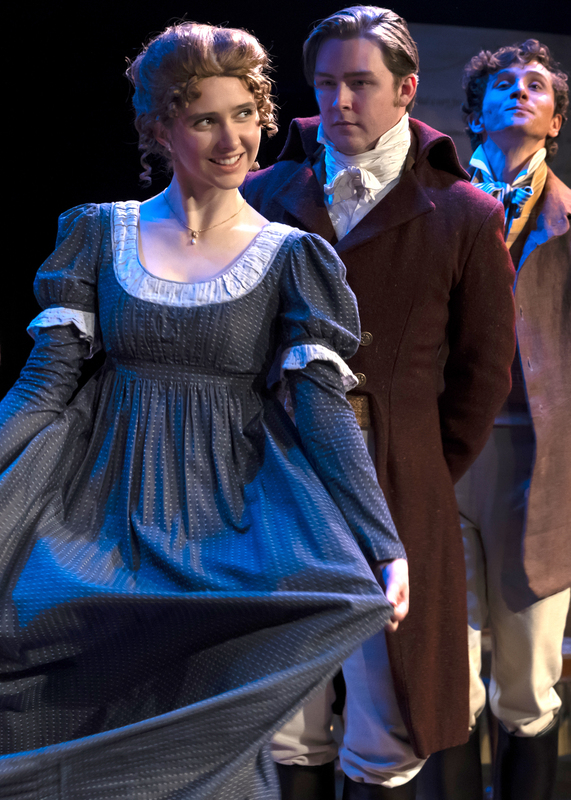 Even with dirt on his face he has such an air of grace, don’t you agree?” Zoya Martin as “Harriet Smith” secretly yearns for Kristofer Buxton as “Mr. 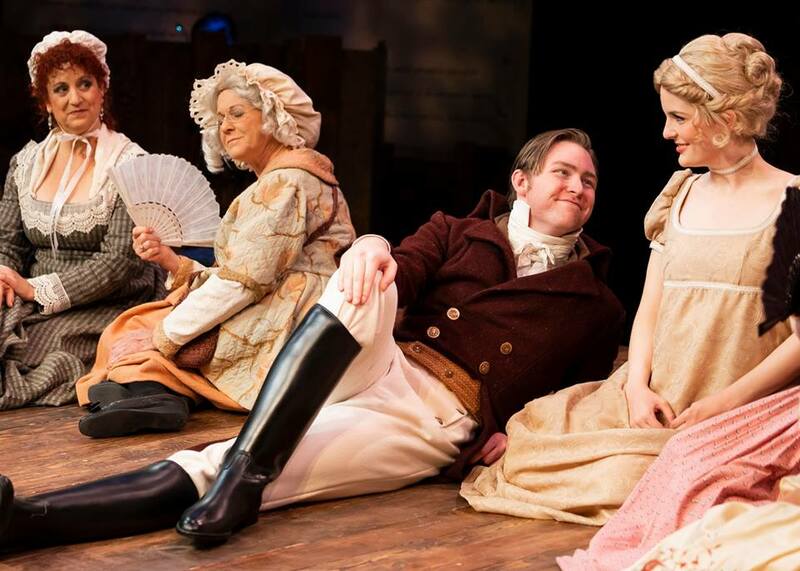 Robert Martin” (of ‘Abbey-Mill Farm’) though select ‘others’ “Have not deemed it, or dreamed of it or approved…” in the regional premiere of Jane Austen’s “Emma, The Musical” at “The Chance Theater” in Anaheim, CA. “Ah, Miss Woodhouse! I thought I might find you here…alone. Miss Woodhouse I can hardly contain myself any longer—I have waited in Agony to have this intimate moment with you…Emma, surely by now you have guessed my feeling towards you…how deeply I am in LOVE with you!” Mandy Foster as “Emma Woodhouse” is taken by surprise over the passionate revelation made by Coleton Ray as “Mr. Elton” in the regional premiere of Jane Austen’s “Emma, The Musical” at “The Chance Theater” in Anaheim, CA. “Emma, the heart wants what it wants—and it haunts me constantly when I’m with you. Emma, my soul lies at your feet; I have been discreet but now I’m overdue…and if I never hold you, if I never touch you—if I never have the chance to quite express what I most took for love, then I will NEVER know love…” Jeff Lowe as “Mr. 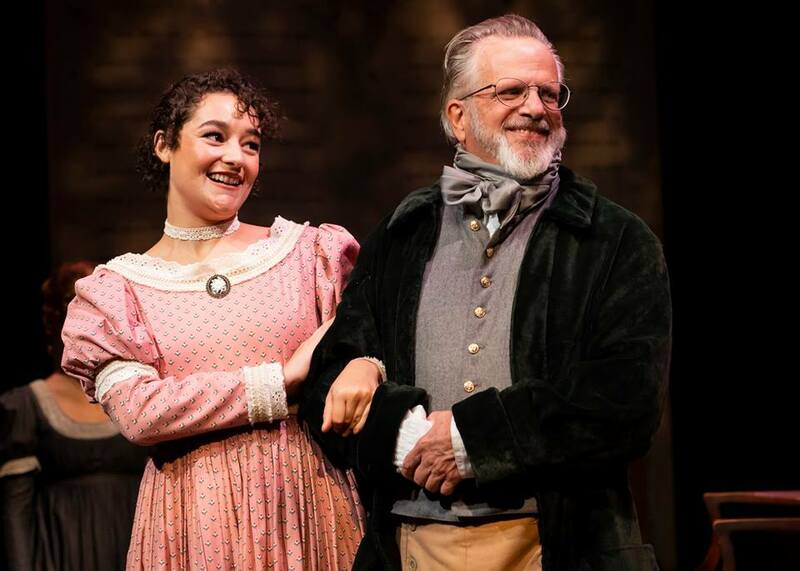 Knightley” and Mandy Foster as “Emma Woodhouse” are a perfect match (if either one will allow themselves to see it) in the regional premiere of Jane Austen’s “Emma, The Musical” at “The Chance Theater” in Anaheim, CA. “What a pristine annoying creature—what a stupendous—icy—stare! Beautiful yes, but something’s lurking (I don’t really want to know what’s there!) What a little minx! 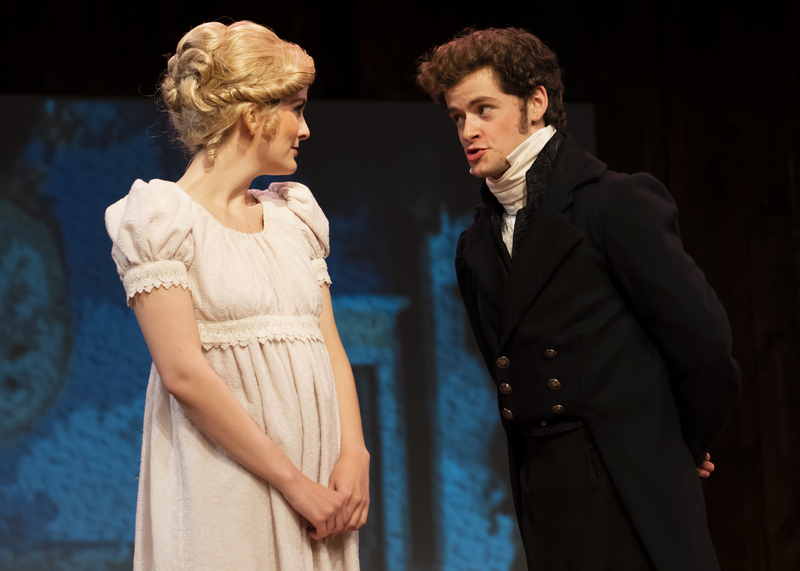 Visitors BEWARE!” Megan McCarthy as “Miss Jane Fairfax”— “Emma’s” ‘imagined rival’, though Gavin Cole as “Mr. 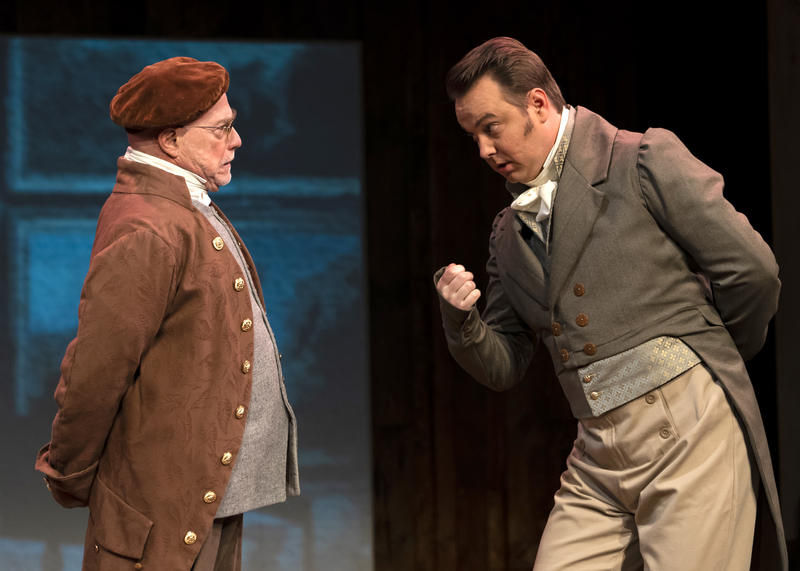 Frank Churchill”, and Kristofer Buxton as the Farmer “Mr. 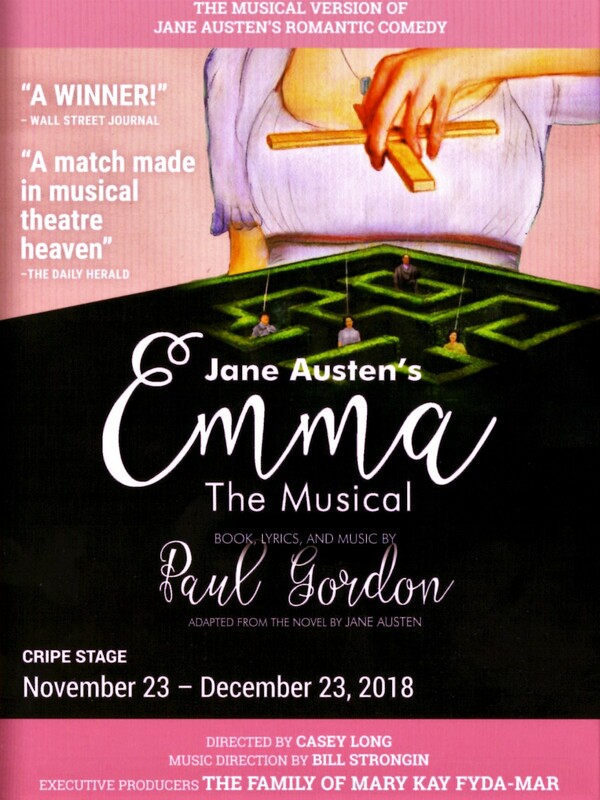 Robert Martin” are likely to strongly disagree in the regional premiere of Jane Austen’s “Emma, The Musical” at “The Chance Theater” in Anaheim, CA. Portraying the fetching “Miss Jane Fairfax” whom Emma, (without any real, immediate cause,) looks on as a rival for her…well, everything, is Megan McCarthy. Appropriately enchanting, demure, pleasant and with an elegant, operatic-quality mezzo-soprano voice, she too is a major part of “Have Another Piece Of Cake”, flung into the very epicenter of Emma’s most scorching (but hilarious) critique: “She paints, she writes poetry, she plays the Piano-Forte…there’s hardly room for the rest of us to exhibit any skill at all!” Emma seethes early on. Later, when “Jane” takes over at the spinet for her part in “The Recital” McCarthy wholeheartedly shows off her potent vocal flair–properly heightening what, on the face of it, is a basic, uncomplicated, parlour tune, into near-symphonic territory and you can’t help but be thrilled hearing it! 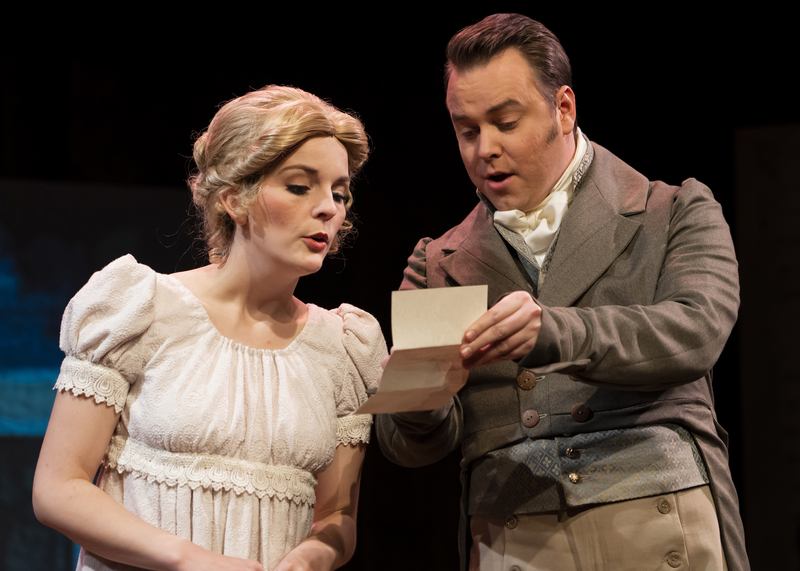 Gavin Cole likewise impresses as the gallant and esteemed “Mr. Frank Churchill” (“a very good-looking and dashing and noble young man,” we’re advised.) Cole’s song-styling is more eloquent—sensitive and smooth, but packing a powerful punch when needed. This he adeptly proves with “Frank’s” inaugural declaration, “Home” which sort of becomes his theme. Conspicuously chivalrous, at the outset he’s the subject of Emma’s starry-eyed obsession; ironically though, his is a tricky enigmatic character to play. Like “Miss Fairfax”, “Frank” doesn’t really appear until towards the close of Act One. Instead, he’s repeatedly referred to, which can present any actor playing him with a unique set of challenges—not least of which being: “how does he live up to all the audience anticipation?” (Especially when seen through our ‘Miss Woodhouse’ s’ decidedly narrow lens of perception.) However, given Mr. Cole’s venerable acting and singing talent and on-stage charisma, his influence is resoundingly felt even when “Mr. Churchill” once more has stepped out of the spotlight. “I do not see the sense in young people getting married; it is a most annoying inconvenience!” Glenn Koppel as Emma’s father, “Mr. Woodhouse” gives Jeff Lowe as “Mr. 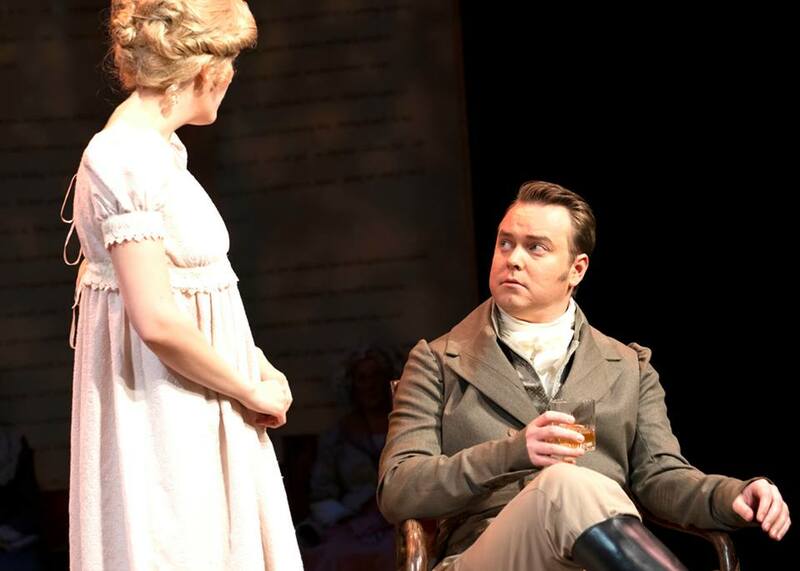 Knightley” his considered opinion of matrimony (especially to his daughter) in the regional premiere of Jane Austen’s “Emma, The Musical” at “The Chance Theater” in Anaheim, CA. “What about our new Vicar, Mr. Elton? It would be a shame to have him single any longer…I must make a match for him! And Harriet Smith is someone I’ve long held an interest in; with the benefit of my guidance I believe I can make her deserving of a man of Mr. Elton’s…esteem!” Colton Ray (Center) is the Vicar “Mr. Elton” flanked by Sherry Domerego (L) as “Mrs. Bates” and Lulu Mack (R ) as “Mrs. Weston”, with Gavin Cole (lower L) as “Mr. Frank Churchill” and Robin Walton (lower R) as “Mr. 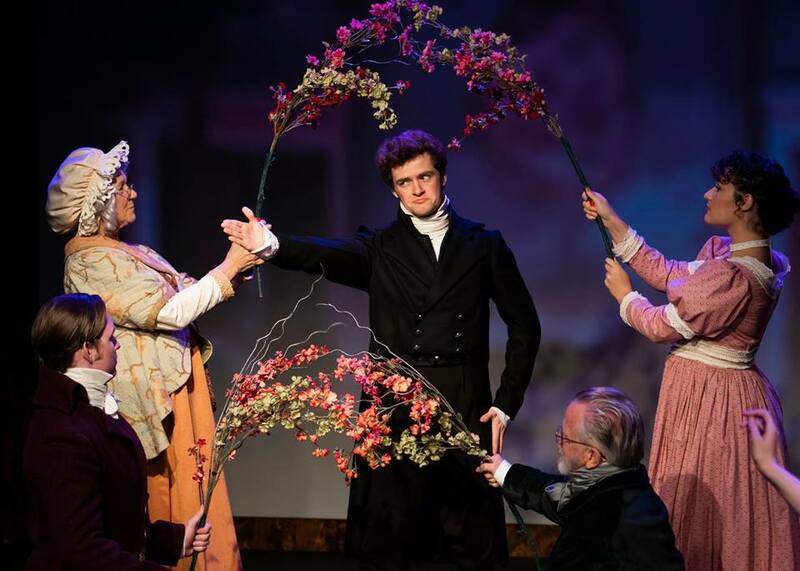 Weston” in Jane Austen’s “Emma, The Musical” at “The Chance Theater” in Anaheim, CA. It seems “Emma’s” work is never done–could still another ‘Match’ be in the making? This time between Glenn Koppel as ‘Emma’s Father’, “Mr. Woodhouse” and their good-natured neighbor, “Miss Bates” (Played by Shannon Page) in Jane Austen’s “Emma, The Musical” at “The Chance Theater” in Anaheim, CA. “Miss Woodhouse demands from each of you either one thing very clever, or two things moderately clever, or three things very dull indeed, and she engages to laugh heartily at them all!” Gavin Cole as “Mr. Frank Churchill” joins Mandy Foster as “Emma Woodhouse”, Shannon Page as “Miss Bates” and Sherry Domerego as her mother, “Mrs. Bates” for a picnic where witty wordplay isn’t the only game occurring in Jane Austen’s “Emma, The Musical” at “The Chance Theater” in Anaheim, CA. 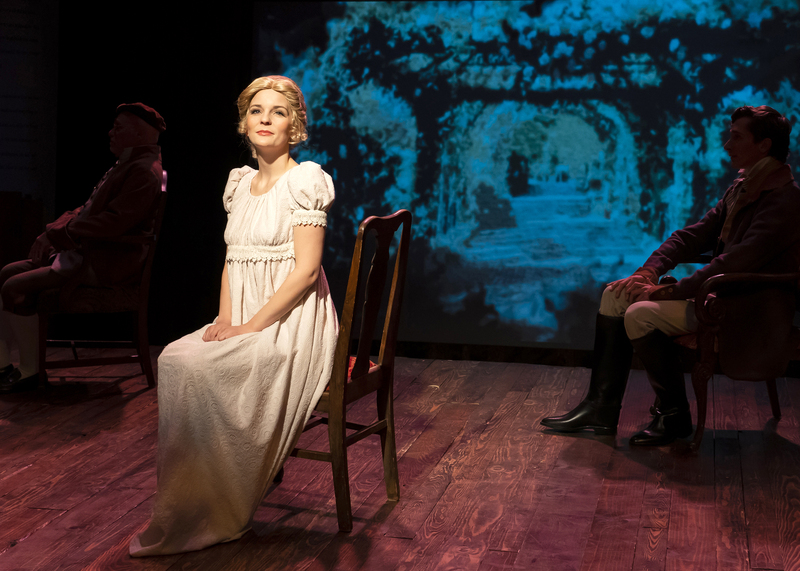 Production Photos by Benjamin Busch Courtesy Of “The Chance Theater”; Special Thanks To Casey Long, Oanh Nguyen, Bebe Herrera, Bill Strongin, And To The Cast & Crew Of “The Chance Theater’s” 2018 Production Of Jane Austen’s “Emma, The Musical” For Making This Story Possible. This entry was posted in Theater reviews and tagged 2018 Orange County Theater Season, 2018 Southern California Theater Season, A Gentleman's Daughter, Anaheim CA, Anaheim California, Anaheim California Theater, Badly Done, Bill Strongin, Box Hill, Casey Long, Classic Novels, Classic Themed Musicals, Comedy Of Manners, Emma, Emma The Musical, Emma Woodhouse, England's Regency Period, Georgian era musicals, Harriet Smith, Hartfield, Have A Piece Of Cake, Highbury Village, Humilation, Jane Austen, Jane Austen's Emma, Jane Austen's Emma The Musical, Miss Bates, Miss Emma Woodhouse, Miss Jane Fairfax, Mr. Elton, Mr. Frank Churchill, Mr. George Knightley, Mr. Robert Martin, Mr. Weston, Mrs. Bates, Mrs. Elton, Mrs. Weston, Paul Gordon, Pride And Sense, Queen Anne Lace, Should We Ever Meet, The Chance Theater, This How Love Feels, Tony Nominated Composers. Bookmark the permalink.